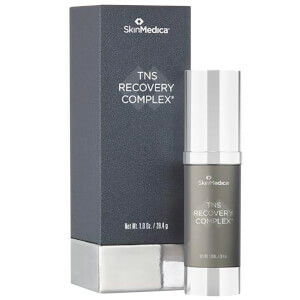 Transform the look of your skin with SkinMedica TNS Recovery Complex, an innovative treatment gel that contains the highest concentration of a patented growth factor* blend to help visibly minimize signs of aging. Suitable for all skin types, the formula has been clinically shown to enhance skin tone, texture and resilience; it targets fine lines and wrinkles and reduces the appearance of discoloration to promote a smoother-looking, more even toned complexion. The formula contains a 93.6% concentration of TNS®. TNS® (Human Fibroblast Conditioned Media) is a naturally secreted and stabilized growth factor blend formulated from naturally occurring growth factors, antioxidants, soluble collagen, cytokines and matrix proteins. It helps to improve the appearance of fine lines, wrinkles, skin tone and texture. Expect a rejuvenated complexion with improved strength, tone and texture. *Growth factors are messenger proteins that are inherent in our bodies and play a role in maintaining healthy skin. Apply a single pump of TNS Recovery Complex to the clean, dry skin on the face morning and evening after cleansing and toning and underneath any other topicals. I have been using this product for over a year and I like the way it tightens and brightens my skin but the price is killing me! I wish I hadn't waited so long to try this! I've been using it for a couple weeks now and already seeing a great improvement in fine lines and discoloration from sun and prior acne scars. It really helps repair and prevent current acne/blemishes which was not something I expected, but I'm thrilled. I've only been using it at night since I'm in my early 30s and don't have extensive wrinkles yet, though I may start using it during the day too for further prevention. It absorbs instantly, while it's not drying, it is also definitely not hydrating. I emailed the company to see if a moisturizer can be used on top, and they said yes, so I wait 5-10 minutes after applying and then top it off with a moisturizer or oil. Couldn't be more pleased. As for the smell, it doesn't bother me at ALL. I was admittedly expecting the worst, but honestly it's nothing to worry about and disappears in seconds. This will be my staple product from now on. I recently switched back to SkinMedica products in the last 2 months after using the products for 10 years. I was using an organic skincare line for 2 years. Within 2 days, my skin was radiant - Cannot believe how much I was missing until I saw the difference almost overnight - it was AMAZING! Extremely pleased with the choice. It is worth every penny!! I've been using this for several years for eye wrinkles. It is well absorbed, only takes a tiny amount and seems to work for me. I love the TNS Recovery Complex. I've been using it for about six months along with a regime of only Skin Medica skin care products. Everyone thinks I'm fourteen to sixteen years younger than I am. The TNS Recovery Complex is the first step of my regime. It's a fantastic product. Awesome Product - It works! This product works! I wanted to try something different as I have been using Perricone MD products for over 7 years. I was aware of the Skin Medica brand and read several reviews on many of their products. I decided to try TNS Recovery Complex and am about 1/2 through? I use the ? mark as you are not able to tell by the packaging how much product you have used. With that said, I am VERY impressed so far with the results. My face appears to be significantly smoother, tighter and more defined around the cheek bones and jaw line. The only problem I encountered is that I need to use 2 pumps to get full coverage on my face vs the 1 the instructions suggest. Not sure how long the product will last doing this but I will absolutely buy it again! Stupid price but at my age and I live in the desert - I had to do some thing fast. Spent hours reading reviews. Decided to buy. Instantly felt tightening . After 3 weeks I swear my age spots are disappearing. My husband says my skin glows. 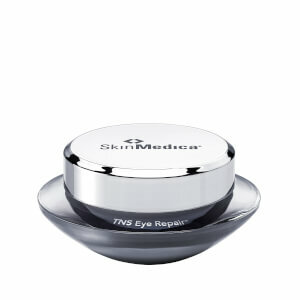 I am also using skinmedica .25 Retinol complex. These 2 together seem to have made a world of difference in my skin. It really glows. I have sensitive skin and worried about the combo but after a little bit of peeling and doing it every 3 days with the Retinol and the TNS stuff every day and night my skin looks like in my 30's . Super happy. I follow up everything with Neutrogena oil free moisturizer. I have been using this serum for a year and still love it. It has a funky smell because of what it's made of, but that disappears quickly. This is the base serum that will feed your skin, smooth it, and get cels to start growing again. My skin feels wonderfully tight and smooth after I apply it. I love this product and continue to spend $$$$ to get it because I think it works!